From coast to coast to coast, here are Canada's most fascinating destinations. 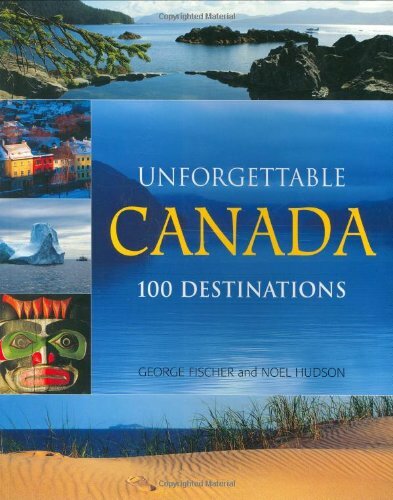 This beautifully photographed and engagingly written guide offers 100 of Canada's most remarkable destinations, spread across every province and territory. Some represent dream excursions to the far reaches of the land, while others are easily accessible from major centers. Each destination offers unforgettable scenic vistas, exotic land formations or unique glimpses into Canada's history and spirit. Destinations include: Agawa Canyon (Ontario) Arctic Toe Dip (Northwest Territories) Athabasca Glacier (Alberta) Big Muddy Badlands (Saskatchewan) Broughton Island (Nunavut) Cabot Trail (Nova Scotia) Cape Enrage High Tides (New Brunswick) Cavendish Dunes (Prince Edward Island) Churchill Polar Bears (Manitoba) Dempster Highway (Yukon) Gros Morne National Park (Newfoundland and Labrador) Head-Smashed-in Buffalo Jump (Alberta) L'Anse aux Meadows Viking Trail (Newfoundland and Labrador) Magdalen Islands (Quebec) Montmorency Falls (Quebec) Peggy's Cove (Nova Scotia) Quebec City Ice Hotel (Quebec) Thousand Islands Cruise (Ontario) West Coast Trail (British Columbia) Yellowknife Diamond Mines (Northwest Territories) and 80 more. For the adventurous or the less daring, here are new sights and locations -- the very best that is Canada.